By early middle age, individuals > 90th percentile in IQ have, typically, more than twice the wealth of individuals who are of average IQ. Note, there is good evidence that positive returns to IQ persist above high thresholds (e.g., IQ=120, or even top 1 percent ability). See here and here. However, the 40% and 60% numbers for transfer payments seem too low to explain the 40K mean income for the bottom decile. My guess would be the mean is skewed by outliers. It would be interesting to see Box plots of the data rather than just the means. There may also be issues with households (I believe the variable is total family income) including more earners for low ability people and/or differential ability within a household. but I found it hard to extract useful insight from that. Of course this doesn't tell you the expected income of different IQ levels, but it might tell you the expected IQ of different income levels. One problem is this method results in such a strong correlation between IQ and income that even I wonder if the SAT overestimates the ability of the rich. That Nature article is literally laugh-out-loud material. If poverty causes stupidity, the authors of that "study" must have come from the poorest in the land! Can you please point out to me which of the references you posted has evidence that contradicts the claim that poverty has negative impact on cognitive function or brain structures associated with cognitive function? This one shows some massive gains for low IQ adoptees depending on the SES of the adoptive parents. 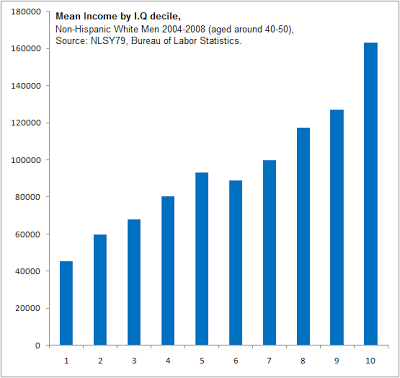 "This last figure is very problematic for the "Social Status/Wealth causes IQ" position. 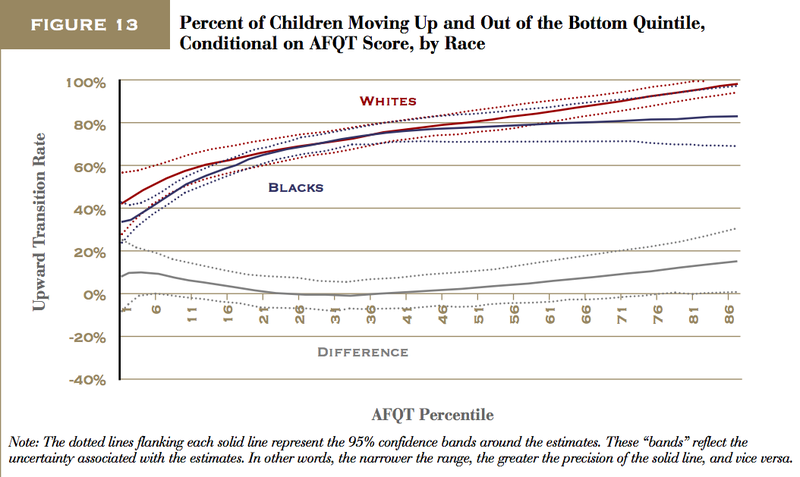 It seems to be the other way around: the kids escaping bottom quintile childhoods all experienced poverty, but the ones with higher cognitive ability were more likely to move up." Its not really problematic because bad environment does not always effect the person experiencing it. Also the kids experiencing poverty don't experience it equally either. It is interesting, although they didn't track after adolescence. At any rate, don't expect rational argument. This blog attracts quite a few characters who are wedded to the idea of IQ as fixed and immutable. Primarily the fourth link which used Genome-wide Complex Trait Analysis to draw conclusions. But if someone faces outright child abuse, then no doubt will that be harmful to development. Whether poverty has the same effect largely depends on how one defines it. It would appear that lower cognitive function is more likely to cause poverty and not vice versa. I think "relatively stable over the lifetime of any given individual" would be a more accurate description of the views many are likely to express here. In cases of real deprivation there are studies claiming a big drop in heritability, although I don't think the subjects were followed to adulthood. (Early gains can be ephemeral.) The PNAS paper I linked to in the post describes a Swedish study where adoption from lowest quintile to highest leads to a gain of ~ 1/3 SD. Has any such study been done? Let’s approach this study from the adopted boys’ perspectives. Their families’ situations had to be hellishly tragic in order to separate the male siblings and put one of them up for adoption. I didn’t find at what age the separations typically took place, but can you imagine what the adopted child felt? In a stable family a child is very sensitive to his caregivers’ words, body language, facial expressions, physical touches–to all the things that show him he is loved. From these implicit and overt expressions, a child learns at an early age whether or not he is accepted for who he is. It’s extremely traumatic for a child to be rejected for who he is. This can happen within a stable family. Can you imagine what a child in an unstable family realized about acceptance? What he felt as he learned he could not be himself and be loved? How he tried to adapt to meet his caregivers’ needs? But everything the adopted child did to be accepted by his original caregivers failed. He was rejected by and ejected from the people who were supposed to love him. Can you imagine how desperate the adopted child would have been in his new environment? What wouldn’t the boy have done to be accepted? 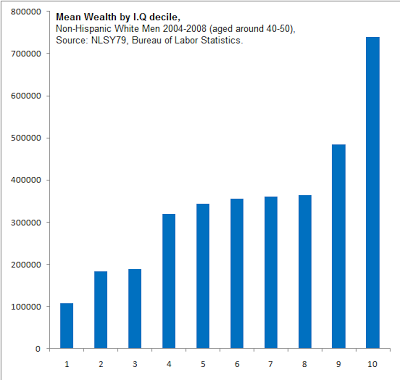 I find it somewhat suspect that the bottom-decile man at 40-50 has $100k in wealth, or that the median man has over $300k. Perhaps assets, but not net worth.